Hi mommies.. I just wanted to get your ideas and past experiences when you did your PTs.. 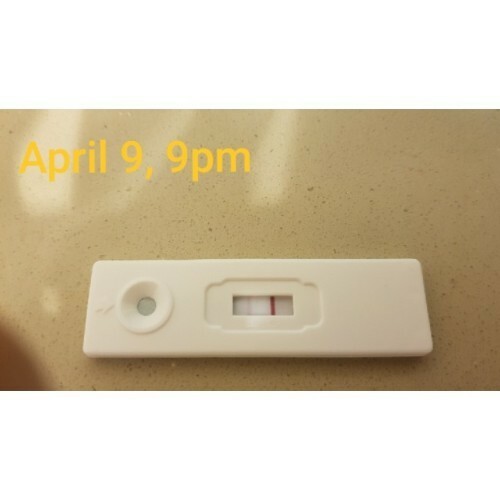 I always have a regular period ever since and this month, it didn't come on its due.. My husband and I are really trying to have a baby for months.. Last April 9, I tested and there is a faint 2nd line on it.. I repeated the test last April 12, first thing in the morning and it is almost looks the same.. Could I really be pregnant? The first day of my last period is March 6.. Photos shown are my PTs.. Thanks for the inputs. Queen of 2 Kids & 1 Upcoming! They say a faint line is still a line. The best is to go the doc to check! Congrats if you are!